When it comes to economics and markets, there are factoids, and there are facts. There are headlines, and there are baselines. Finally, there’s cherry-picking, and there’s trend-exegesis. The Acela Corridor runs on factoids, headlines, and cherry-picking. That’s how Imperial Washington and Wall Street sustain their fantasy. It’s fed by monetary central planning. And it’s nurtured by both the Mainstream and the MAGA versions of Bubblevision. My mission is facts, baselines, and trend-exegesis. That’s the only way to expose the rotten foundation. For instance, it’s a fact that total U.S. debt has grown from $53 trillion to $70 trillion since the Global Financial Crisis/Great Recession. It’s also a fact that the U.S. economy’s historic 1.5 times debt-to-income ratio has expanded to 3.5 times over the past 50 years. Here’s the context for its most recent stages… another combination of facts, baselines, and trend-exegesis about the pitiful growth rate of the business sector of the U.S. economy. To wit, on a one-year, six-year and 11-year basis, the annualized growth rate of total business sales – manufactures, wholesale, and retail – is just 2.0%. That fact is of overriding importance. Business sales are the source of all “value added.” And value added is what leads to real prosperity and wealth-creation. 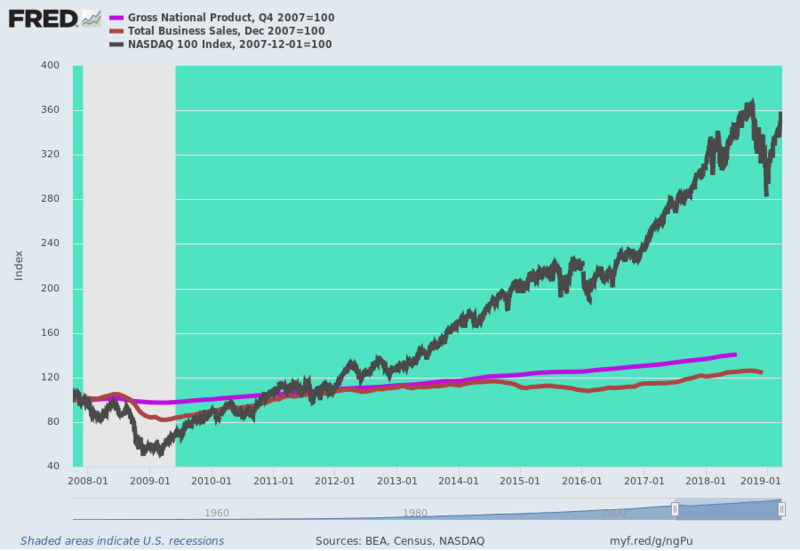 Now, let’s talk about “trend.” When it comes to directionality, that 11-year-long 2.0% nominal growth factor demolishes both the Donald’s and Wall Street’s narratives. It’s still a 2.0% economy in nominal terms. And it’s a flat-lining one after you wring out the inflation. As it happens, that was true on a December-to-December basis in 2018, even after an insane $300 billion fiscal stimulus/Treasury borrowing spree during year No. 10 of a tired business recovery. Pulling back for some more perspective, our 2% economy reflects a radical downshift and deterioration from the 5.0% trend in nominal business sales that prevailed from 1992 to 2007. The “recovery” since the pre-crisis peak has been abnormal and bifurcated, a sharp break from typically broad-based recoveries of the past. Wall Street and Main Street have also uncoupled. The Nasdaq 100 Index is up by 250% from its pre-crisis peak. That’s a compound annual growth rate of 12% over the last 11 years. By contrast, nominal GDP and total business sales have grown by just 3.23% and 1.99%. That is a radical disconnect. It’s a Bubble Finance-blown boom, and it wreaked enormous damage on the Main Street economy. It fostered financial engineering by Corporate America, as CEOs and CFOs strip-mined balance sheets and cash flows to buy back stock rather than invest in new production and workers. And it led to the election of the Great Disruptor. The question remains how the U.S. breaks out of this low-growth rut. Indeed, the U.S. business economy was, is and will be growing at just two-fifths of its pre-crisis rate. That amounts to the fiscal death knell for the Welfare State, the Warfare State, and empire-encumbered America. And that’s the most important trend of all.